Did you know that chocolaty beverages have been around for 2,000 and first made by the Mayas? 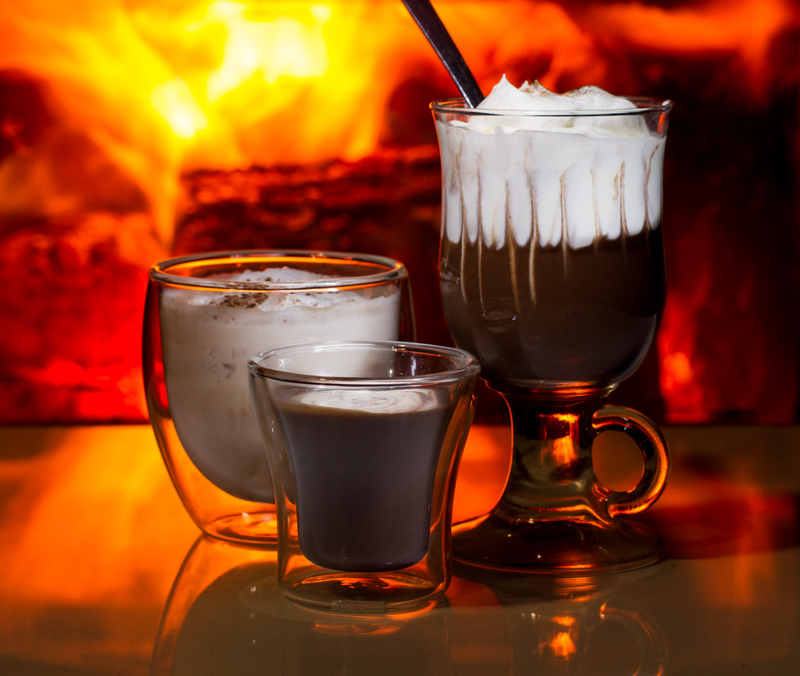 Today, many cultures enjoy hot and cold chocolate beverages made from either cocoa or melted chocolate, sugar and milk. Additions such as vanilla, cinnamon and of course marshmallows have been introduced. The drink has come along way from the xocolatl that was said to be an acquired taste. Check out Wikpedia if you are a history buff and want to know more about the original drink. When my kids were younger, hot chocolate before bed was a tradition. Powdered mixes or chocolate syrups were as common in my kitchen as milk and bread, and it took nothing for me to whip up two warm cups of cocoa and settle down to a story before bed. Turn the clock back about two decades to when I was in France as a teen. Hot chocolate was served at breakfast with baguette and had a more elegant taste than I was familiar with back home. So, when I started looking for a more sophisticated version of hot chocolate to use in virgin drinks, it was natural to research and find out what made this Parisian drink different from my kids night time beverage. Turns out what is drunk in France, and elsewhere, is called drinking chocolate. This beverage is made from milk or cream and melted chocolate and can be as thick as pudding (in Spain), or diluted with water and spiced (in Peru), and vary from creamy versions offered in bowls (in France) to strong and rich portions in demitasse cups (in Italy). In order to make a chocolate beverage or ingredient in beverages I wanted something rich creamy but not too bitter. Here are a few recipes we tried as a family. My first search results lead me to about.com which had a good step by step guide to the technique and a link to recipes. This recipe is simple, and can be found here. Take 3 cups milk and heat in a pot, add 6 oz semi sweet chocolate (chopped fine) and let melt. Pour and serve. Nothing to it. How did it turn out? Strong, not sweet, and not a hit with the kids. Ok for sweet drinks and mixed drinks, but not great as a stand alone. This version of drinking chocolate uses some sugar, whole milk and may or may not be diluted with water. In attempt to get the first recipe more to an all ages palate, I chose to keep the recipe as similar to the first as possible for best comparison. So I added 2 tablespoons sugar, used the same chocolate again, and tried whole milk instead of my standard 1%. (I omitted the water from the recipe). The original recipe for French Hot Chocolate I used can be found here. The results were better, sweeter but there was not enough creaminess for my family. Back to the kitchen and back to the internet! Another recipe another test. David Lebovitz offered a drinking chocolate recipe on his website davidlebovitz.com that called for 2 cups whole milk to 5 oz of chocolate and 2 tbsp brown sugar. The result was much thicker, but still a bit too strong for my kids. What to do, what to do? While about.com suggests that Parisian Warm Chocolate is made with heavy cream and whole milk, I couldn’t find the recipe it wanted to link to. Thanks to Allrecipes out of the UK i found a recipe that suggests half double cream, half milk (half cup each) to 4 oz dark chocolate. This seemed more chocolaty but also richer in milk product but posed a problem. Double cream is 48% milk fat and is not available in Canada. Whipping cream is 36% fat. Ok so out comes the science and math! See Zoe, what you learn in grade 6 does apply to life! Mixing Double Cream at 48% with equal parts whole milk at 3.25% makes a milk product of 25.6 milk fat. This is thicker that half and half (18 %) and thicker than whipping cream which were my two choices in town. Back to the math to figure out proportions. Here is the Canadian version and what I settled on as the best ever drinking chocolate tested so far. This is based on the various drinking chocolate recipes that use cream, but with the addition some cocoa powder and brown sugar, suggested by some of the recipes. Heat milk and cream in pot over medium low heat. When milk is warm add chocolate and remaining ingredients. Stir until melted. Remove from heat and allow to cool or serve warm in demitasse glass with a splash of cream swirled in the top. This produces a rich thick chocolate drink, with enough sweetness and strength to work in multiple recipes. Served cold it’s thick like pudding and needs a spoon, while warmed up it thins to drinking consistency. One recipe served four 3 oz demitasse glasses, made two warm chocolate drinks and I had enough to make up some frozen hot chocolate! It should last about a week, if your kids or you don’t get to it all first! I served this to my guest tonight—all the way from Yellowknife (originally from South Africa) along with my daughter and hubby. All three gave the thumbs up on this creation. “Not what my taste buds expected” was the comment from my South African friend. Taste: 5/5 the perfect blend of dark chocolate richness with creamy taste. Simplicity: 4/5. now that I have done the math for you, a cinch! Ingredient finding: 5/5 all Canadian Ingredients, all easy to find at my small town store. For some fun ideas with this drinking chocolate try the following. Blend Drinking Chocolate and 6 ice cubes in blender until finely chopped. Pour into two old-fashioned glasses, margarita glasses or martini glasses. Rinse blender and add remaining ice cubes and half and half cream. Blend until ice is finely chopped and spoon icebergs of frozen ice on top of each drink. Sprinkle with shaved chocolate and serve. This dilutes the flavour of the drinking chocolate to a milder taste but retains it’s flavour complex The result is a little more like milk chocolate with an edge of the original semi-sweet tone. My husband figures this should be eaten with a spoon, or possibly a straw, or just give it a few moments, swirl and drink! Half fill a coffee cup or specialty mug with hot drinking chocolate. Whip a batch of fresh whipped cream and generously top to fill the cup. Top with a sprinkle of cinnamon and serve with a long spoon. Tell them to stir and enjoy! When you stir the whipped cream into the warm chocolate, you get something very much like what the Spanish have for breakfast: warm chocolate pudding. This is great for guests who prefer a more creamy drink. If you prefer to keep the drink hot and more liquid, consider warming the cream and simply layering it on top of the chocolate below. Posted on October 15, 2014 October 30, 2014 by orionssong	This entry was posted in coffees, lattes, chocolates and teas, Creams and tagged chocolat chaude, double cream, drinking chocolate, history of hot chocolate, hot chocolate. Bookmark the permalink.